100% NON-STICK - 100% Non-Stick means you can grill without grease and mats are reusable for years! Never BBQ on a nasty, dirty grill grate AGAIN! Keeps your food from falling between the grates or sticking to the grill! Keep your grill looking brand-new and no more clean-up of your dirty grill! [FDA APPROVED] Our grill mats are PFOA BPA Free. 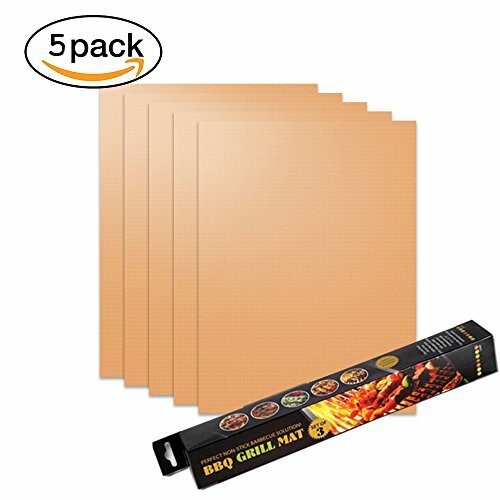 Made from 100% PTFE nonstick coated fabric, this set of BBQ grill mats measure 15.75x13 inches and can be cut to any size to fit your needs. 500 DEGREE Peak Temperature - These barbecue cooking mats which are made of heat-resistant technologically advanced materials. These mats are heat resistant up to 500 degrees Fahrenheit! [EASY TO CLEAN] No more scrubbing grill grates every time you cook! Quickly hand wash with soap and water or stick in the dishwasher(top rack only) to use over and over again. LIFETIME GUARANTEE - If you\'re not completely satisfied, we\'ll make it right or your money back. Check out the \"Special Offers And Promotions\" section below to learn how to save money on todays purchase. Try yours RISK FREE before we sell out! Consider getting TWO - one for you and one for your very best friend!